This is from the sixteenth part of the handbook, finishing the look at where the materials used for making our clothes come from and how they are processed to achieve the forms to be used by the tailor. 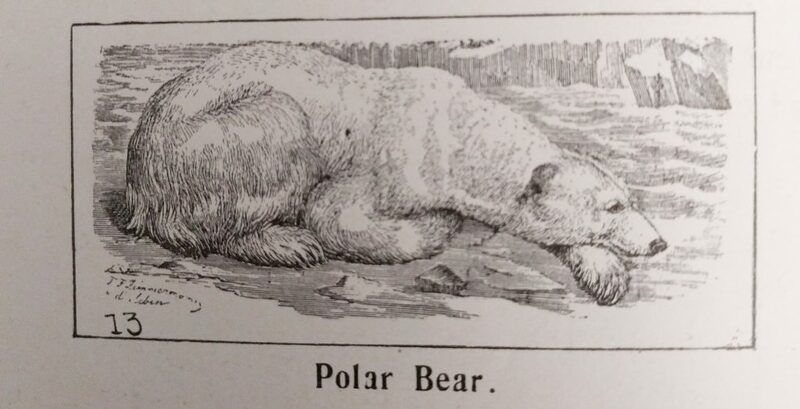 Some of the details may seem a little distasteful these days but this is from the time before most man made fibres we use today were available, and it was necessary to use animal skins for certain types of clothing. The moth, as discussed towards the end, is still a problem today. Some parts have been summarised as the information is available elsewhere on the web. I have now to invite your attention to the products of the animal kingdom that are used for clothing, and these are certainly the most important from the tailor’s standpoint. The difficulty I experience is how to convey the information I desire in a small compass and a popular form so that you may realise how very much there is to learn, and so that you may grasp the principal points connected with each subject. I hope you will have your interests so awakened that you will follow up this study by getting as many books as possible from the libraries at your disposal, for I am certain you be a better tailor if you master such a subject as the present one. In this conviction you will be greatly helped if you can prevail on a few of your friends to club together and hire a set of 54 lantern slides from Messrs. Riley Bros. of 55, Goodwin Street, Bradford and read their lecture entitled, “From the Sheep to the Shipper.” The cost of the hire is about 3s., plus carriage. (Riley Bros were manufacturers of Magic Lanterns and early cinematography equipment – if these slides were around today they would probably cost a lot more than £3. It also shows there is nothing new about a magic lantern show, even if we now call them Powerpoint…) The lecture was bought to my notice by Mr. Scarr, of Halifax, who delivered it before one of the industrial schools in the neighbourhood, and also before the Halifax Foremen Tailors’ Society. Now let me come to the subject itself. Wool is the hairy covering of animals, which, besides being very soft and wavy, has cross or slanting lines or scales. It gows on various animals, the principal one being sheep, but it is also obtained from the Angora goat, the Llama, Alpaca, Vicugnia, and the Camel. Recent discoveries of the remains of sheep, together with the stone weapons of a people who existed long before the records of history point to the conclusion that the sheep is an animal with a history contemporary with that of man. In the earliest records we read of Abel keeping sheep, and all the patriarchs were possessed of flocks , whilst all around them were shepherd kings. For some reason the Egyptians disliked sheep’s wool, and so we find nothing about its manufacture in their records. Some have thought it was a part of their religion to avoid it, others think that the tyranny of the shepherd kings, who occasionally conquered them, had something to do with this, whilst, others think that the fine and equable climate of their country made vegetable fibres more suited, but, be that as it may, they are the exceptions to the general run, for Palestine, Syria, Greece, Italy, and Spain have all made wool the staple material of their clothing, just as the inhabitants of Central Asia have employed silk, and the Indians have used cotton, or the Egyptians have used flax. 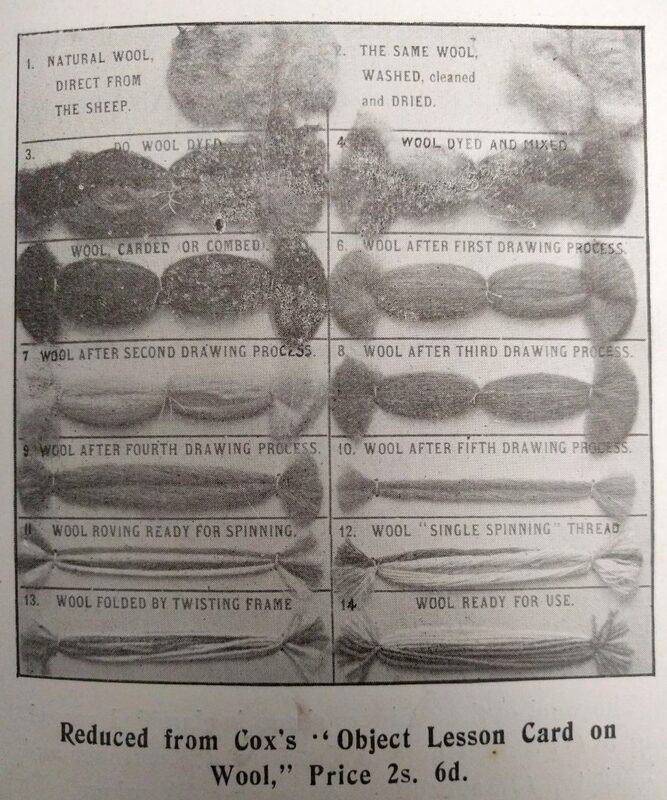 The wool of the ordinary sheep is classified according to (1) the fineness of the fibre, (2) softness and elasticity, (3) soundness of staple, (4) colour, (5) cleanness, and (6) length of staple. The weight of the fleece of a single sheep varies from 2lbs to 10lbs. 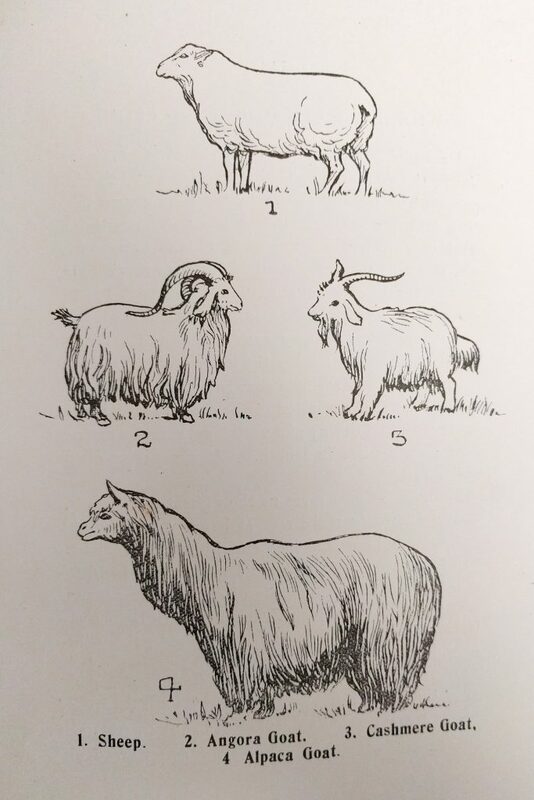 I am giving you the outline drawings of the ordinary sheep, the Angora and Cashmere goats, and the Alpaca. The wool of the cashmere goat is very soft, rich, and lustrous. It is reared on the high table lands of Thibet, which are some 12,000ft. above the sea, and this very fine covering is Nature’s covering to protect it from the severe cold. This goat has an outer coat of hair, and an inner coat of wool, and this inner coat is by no means as full as the fleeces of other sheep. It takes the innner coats of at least ten goats to make a single shawl about 54in. square. The Alpaca is a relation of the camel, and its wool is very soft and downy and very long, samples having been shown 42in. in length. Alpaca fleeces often weigh 12lbs. The Angora goat gives us the whitest of all wools, and is known as mohair. It has a very silky appearance, and hangs in long curls, 5in. or 5½in. long, and the fleece of one goat weighs from 2lbs. to 4lbs. By far the largest quantity of our wool now comes from Australia and New Zealand, and in 1898 Australia alone exported 660,000,000 pounds, the value of which was nearly £30,000,000. (That would be about £3,389,550,000 in 2017). During the last year or two the farmers have found the sheep that grew the best wool were very small and that carcass of the sheep became valuable. Thanks to freezing machines they gave up rearing the small breed of sheep, and this caused a serious rise in the price of the finer wool, and though this has rectified its elf in some measure, yet wool is much higher in price to-day than it was five years ago. 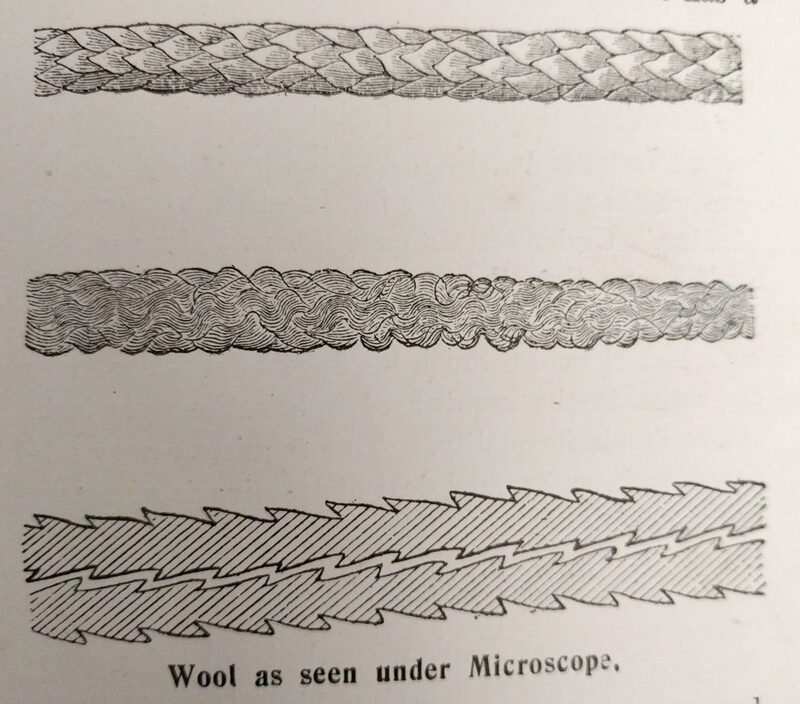 If you take a single hair of wool and pass it through your fingers you will notice that it has a thread-like appearance, and if you hold it by one end you will see it is very wavy. 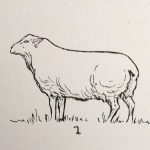 The diameter of coarse wool is 1-400 of an inch, and of the finest about 1-500 of an inch, and between these extremes there are all possible variations. Now place this thread under a microscope, and you will be surprised to find there is a pattern on it, and that it very much resembles a fir cone, or is like tiles on a roof, having little scales or imbrications all the way up. These are so fine that on the finest wool it takes 2,700 to 2,800 to measure an inch, and yet it is to them that some of the more remarkable qualities of felling or binding together are owing. Now suppose two woollen hairs are placed with these scales running in opposite directions, they would fit into each other and so become fastened together, and if this is done under pressure they adhere very firmly – this is know as “felting”. Under certain conditions woollens mill or thicken, and then these overlapping scales interlock each other like reversed teeth. A skillful sorter passing a lock of wool through his fingers the reverse way can estimate the number of imbrications per inch, and so decide its quality. This requires a very sensitive touch, and a good deal of training is necessary to acquire it. Generally reaches England packed in bales compressed by the aid of hydraulic pressure so as to reduce it to the smallest compass. First the farmer shears the wool from the sheep’s back, then he sells it to the wool staplers who go round the country to buy the wool, then it is dispatched to the nearest railway station, perhaps 60 or even 100 miles away, by road wagon, then it journeys to the nearest or most convenient seaport, where it is put down in the hold of a fast steamer and brought thousands of miles over the sea till it reaches England, where once again it is placed on the railway and delivered to the mill, say, at Bradford, Huddersfield, or some other centre of the woollen industry. Sometimes it reaches the mill on the skin, the wool and the skin being taken from the sheep together. However, it has arrived at the mill, and we will take a a journey through one of these together, and learn as much as we can of the many processes it goes through before it reaches the cutting-room or the workshop for us to exercise our skill upon. The picture of Messrs. Bannerman & Sons’ Mill at North End and River Meadow may be taken as a fair sample of the places where wool is transformed into woollens and worsteds, although this actually a cotton mill but it is practically the same as a cloth mill, where the raw raw material is manufactured into these beautiful cloths from which we cut the garments our customers require. We enter the mill and find ourselves in a sloppy shed, with a smell that is anything but pleasant; here the wool is taken from the skin, unless it has been shorn from the sheep, when it may at once be cleansed of dirt, thorns, thistle heads, etc. Then it is scoured in a machine which is specially designed to remove the grease and any remaining dirt. It consists of two tanks, the first of which contains hot scouring liquor made of water, soap, soda or other alkali. The wool is placed on a revolving lattice, and carried forward into a cistern. Here it is thoroughly steeped so that no part of it floats on the surface. From here it is delivered to squeezing rollers, and, after passing through these, it goes to the second tank, which is filled with tepid or cold water as soft and pure as possible. It is then free from grease, and it will now weigh barely half what it did before, indeed, in some cases, wool has been known to lose 70 per cent of its weight in scouring. It is then dried in a machine having a large chamber full of shelves or tables, and hot air is forced through by means of a fan. 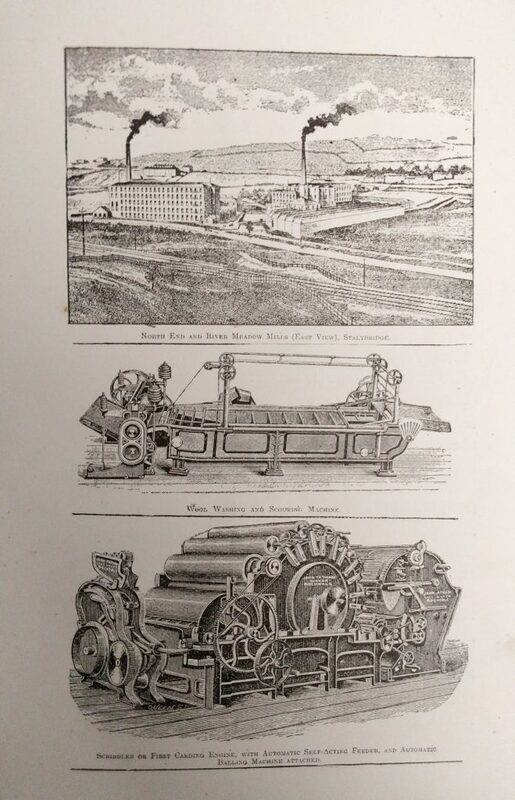 The next step is to take it to a machine known under various names, the best of which is, perhaps, the “Teaser,” and in this it has to go through teeth and combs arranged on cylinders revolving at the rate of 400 to 500 per minute. This separates the fibres and removes the last particles of dirt, so that when it comes out it looks likes soft, fleecy locks. 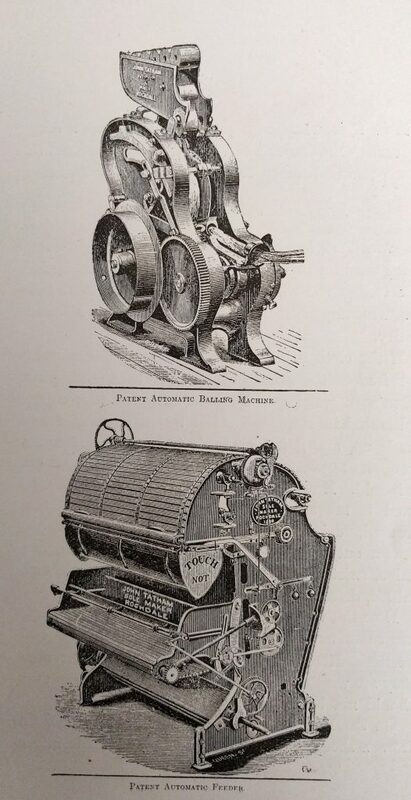 Which are arranged in sets of three, the “Scribbler,” the second carding engine, and the “Finisher” (see illustrations of these). This is a very important operation, and upon it depends the ultimate condition of the yarn. The object of carding is to make the fibres lie together under all sorts of conditions. It comes out of the first machine in a long, filmy thread, called a sliver. 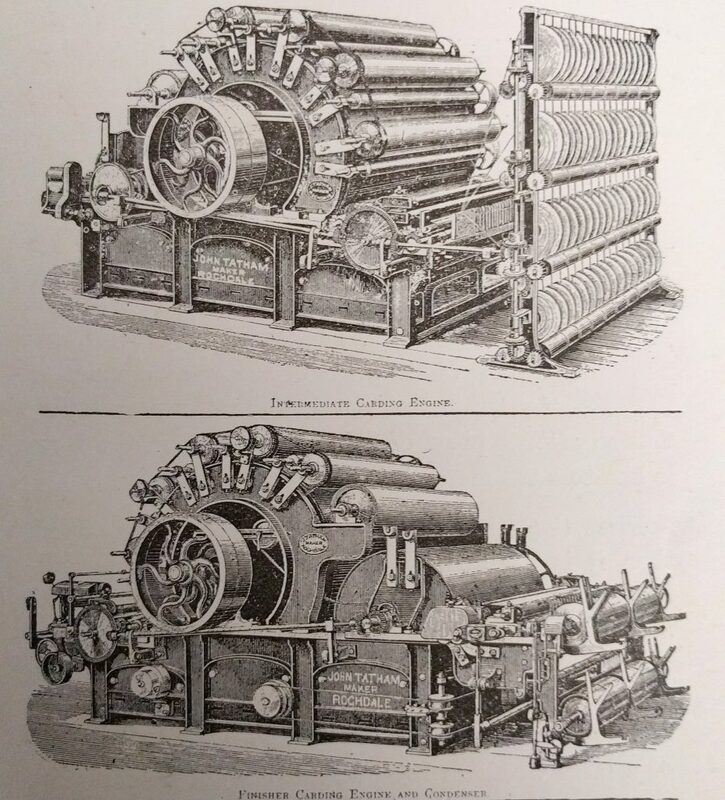 On all three machines there is a large cylinder surmounted by a series of rollers, all of which are clothed with fine wire set in rubber or leather; these are slightly bent, and arranged in opposite directions, and thus the wool is arranged in thread-like form. The first rollers are fairly coarse, but each successive one gets finer and finer. and here it is spun in much the same way as cotton, more twists being given to the threads intended to be used for the warp than those used for the weft. are then taken to the Warping Machine, where these lengthway threads are laid in a very regular manner side by side. Here we are shown the bobbins arranged on the creels, all converging to the “heck box,” which controls them so that they shall run easily and regularly. It is then shaped into bundles and sized, this making them more ready to cling together. It is now ready to be taken to the loom, where it is woven into flannel or cloth of the pattern and weight desired. The arrangement of yarn to produce the pattern is a very interesting process, and needs the dyeing of the yarn before weaving, but in the case of so many flannels and cloths it is piece dyed, and so after a piece of flannel comes from the loom it has to have many finishing processes. First the oil has to be removed, them it is dyed, then it is “milled”, a name given to the interlocking of the fibres by the scales previously described, and which gives the cloth a very solid feel. Flannel is only slightly milled, whilst cloth may be single, double or treble milled, the heavier, thicker, and more solid do they become. This is done by the aid of a large wooden wheel, which lifts and releases two heavy wooden mallets, which rise and fall with the revolution of the wheel. These strike the wet material placed under it, and this beating knocks the threads together, and so the milling is accomplished. in which it is stretched on hooks, the selvedge being used for this purpose, and if you look at a piece of selvedge you will see where these hooks have gone in. This adjusts the width of the cloth and allows it to dry. If the cloth is intended to have a rough surface , it is raised on the surface by teazles, a thistle-like plant often seen growing in England, although it is chiefly cultivated in France. After this it is pressed it is pressed and made up, and it is then ready to be delivered to the woollen draper, who will probably have it shrunk ere it is sold. Now, what does all that amount to? The wool is taken from the sheep and sorted. It is scoured, dried, opened in the willowing machine, drawn out into very fine threads in a carding machine, twisted on the “Mule”, spun, woven, cleaned, milled, dried, tentered, teazled, etc. Now this usually takes a very long time, but there are some wonderful stories of rapidity in this connection. Here are one or two. I give them for what they are worth. Personally I see no reason why they should not be true. On the 18th May, 1898, the wool was sheared from a sheep at Stroudsburg, Pa., and made into a suit of clothes in 6 hours and 4 minutes. The best previous record for a similar performance is 7 hours 55 minutes by Messrs. Hogg, of Selkirk. The preparing the wool took 2 hours 20 minutes, the weaving the cloth another 3 hours 15 minutes, and the making up the suit 2 hours 20 minutes, a total of 7 hours 55 minutes. I saw a piece of the cloth, which was grey Cheviot, and the suit was made for Mr Allan, a yarn spinner, who sat down to dinner in it at 2 o’clock the same day as the sheep was sheared at 6am. In the former case the suit was made for Mr Litson, of Stroudsburg. Work was begun at half-past six in the morning, by six shearers, who soon sheared the wool from as many sheep. The wool was then, with amazing quickness, scoured, dried placed upon the picker, passed through the card room and prepared for spinning. It was then, after going several other processes, spun and made ready for conversion into cloth. This required eighteen processes. After leaving the loom the cloth underwent seven or eight different treatments before it was ready for the tailors. Then six tailors, says the “Sartorial Art Journal,” received the cloth, and cut and made the suit in two hours and a half. There are two other remarkable cases of garment building from the wool on the sheep’s back, which are well authenticated. One occurred, early in the century, when John Coxeter, of England, a celebrated cloth manufacturer, won a wager that he could have a coat made between sunrise and sunset of a day, from wool which should be growing on a sheep’s back in the morning. Nine men were employed in the work, and the coat was finished in 13 hours and a half from the time the wool shearing began. The other occurred at Bath, in America, in 1816. The feat was performed by a tailor named George McClura, and the time occupied from shearing the sheep to finishing the coat was less than 9 hours. The shears which cut the coat are still exhibited by the Steuben Agricultural Society. Thus you see it is quite possible to do all this work very speedily but it is very seldom that work done against time is done well, and it will certainly be best for you to cultivate the habit of thoroughness, and let speed come afterwards. Having dealt with wool in the various processes of making into cloth, it will not be necessary for me to describe in detail how camel’s hair and such like goods are made up, suffice it to say that in general principles they are treated in the same way. As a general rule, it is only the finer kinds of hair that are made up into cloth, the exception being horse-hair, which is woven into a stiffening, and is very useful for many purposes in the manufacture of clothes, especially in the building up of shoulders and fronts. 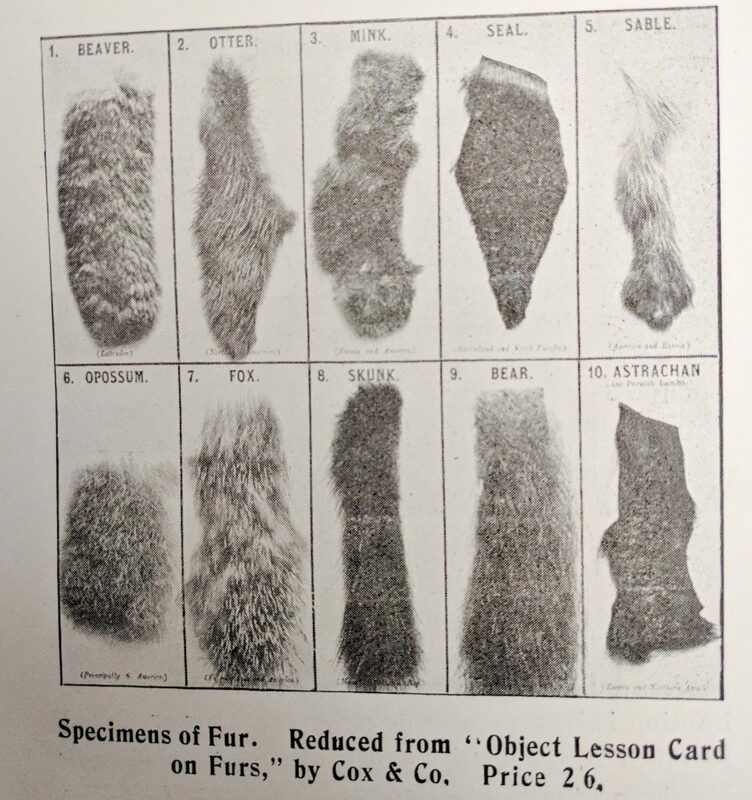 In connection with hair we have to consider fur, or hair left on the skin of the animal upon which it grew. 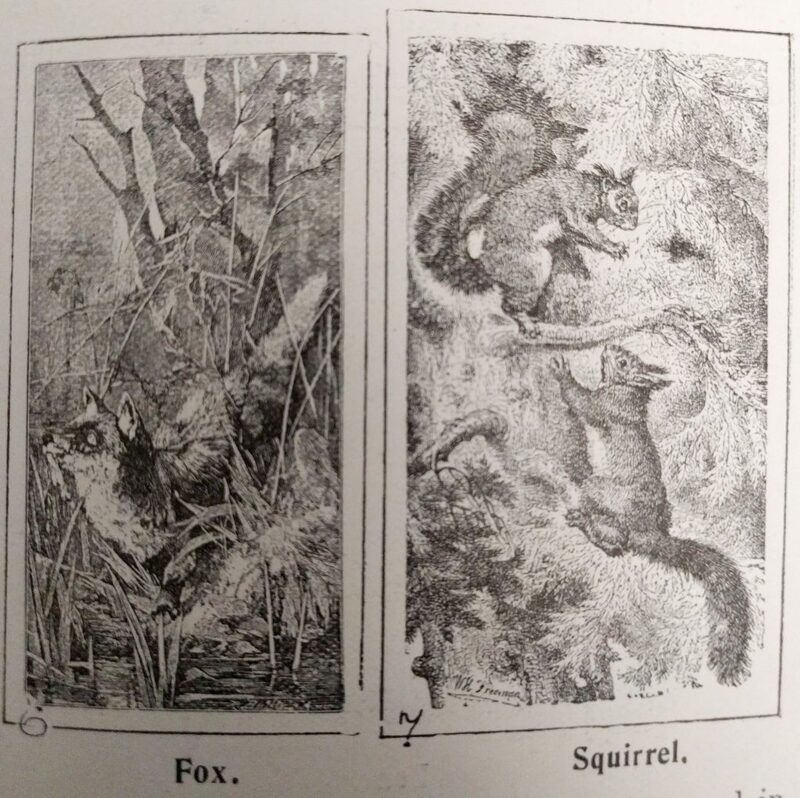 This is very varied, both in kind, source and cos, and it will afford you many interesting lessons in natural history to trace out the story of this or that fur you may be using. Fur is largely used in our own country for ornamental purposes, but, apart from that, it is becoming very fashionable for motor caring costumes, the leather backing being said to withstand the cold resulting from the rapid passage through the air, so that it is quite possible that in the future fur will be more widely used than ever. The history of our English Monarchs abounds with references to fur garments, and in this respect they are in keeping with those of other countries, for Herodotus, the ancient historian of the East, tells us that Queen Semiramis brought back a large number of tiger-skins from an expedition she made to India. 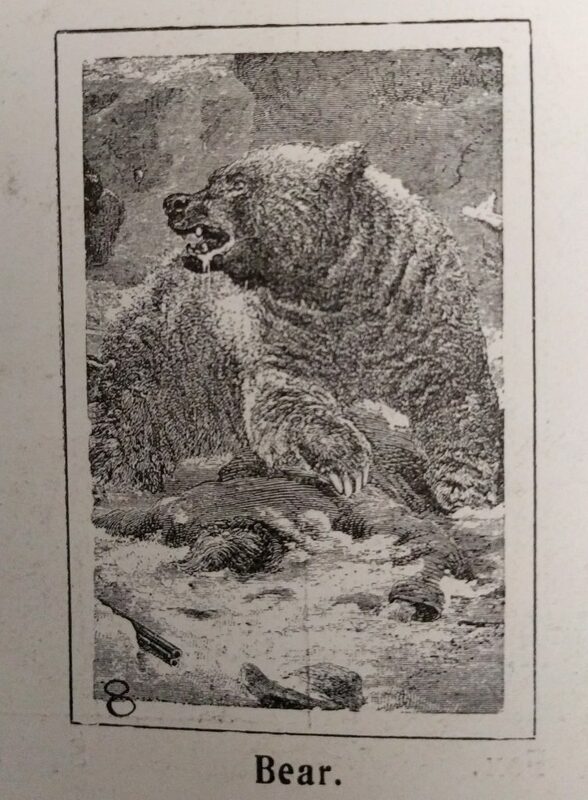 A most interesting book on furs and fur garments is published by The International Fur Stores, and in it you will find many illustrations of Kings’ and Queens’ fur or fur-trimmed garments. 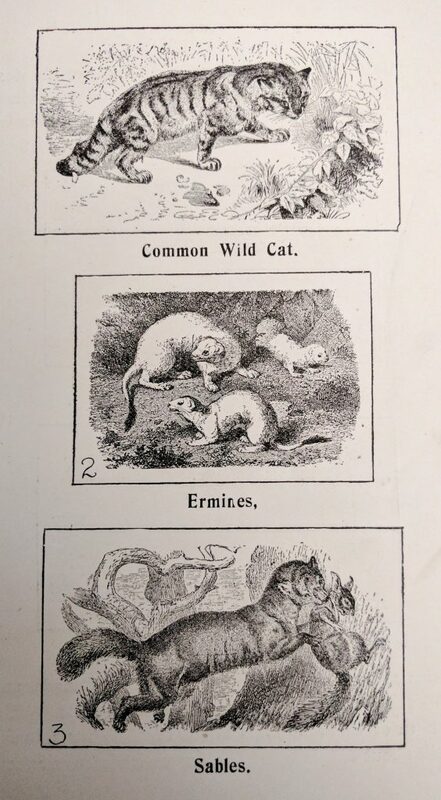 After a short piece on the many fiction stories available that were attached to the (apparent) lifestyles of those who spent their lives obtaining furs by trapping and hunting, etc, WDF then goes through the many different types of fur obtained from the animals shown in the following pictures and where they came from. I also covers the uses of these furs as skins, rather than just the fur, as trimmings etc. to clothing. 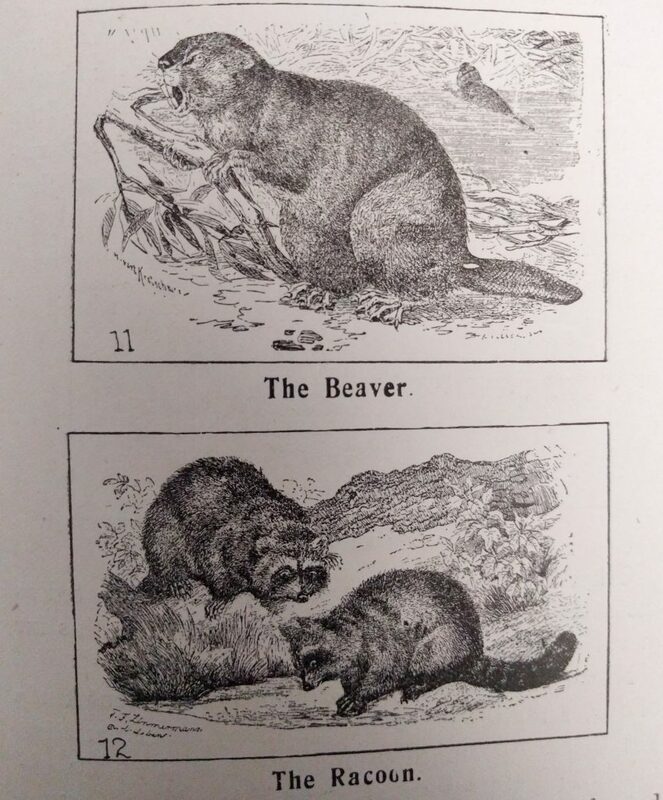 Now I must stop my descriptions of different kinds of fur, for although there are many other varieties, yet these will suffice to indicate how they are obtained. Before I depart from this subject, I must refer to the two methods of manufacture. Hitherto I have referred to dressed furs, in which the leather has been left on the back of the hair. Now, you will understand that before this can be used it has to be cleaned, purified, dyed, and made up, and this requires great care and skill, and it is sometimes surprising how skillfully the small pieces of fur can be joined together. If ever you have to line a coat for a lady or gentleman with fur, your best plan will be to send the pattern of the garment to the furriers and let them prepare it for you, and then you can put it on to the outside . You must remember that fur must not pressed under moisture, otherwise it will shrink and shrivel up, and if you ever have to cut it you must always cut it with a knife on the kind of serging stitch from the back, carefully pushing all the hairs through to the front as you proceed. The other method of making-up fur is to separate it from the skin, and to force them together in a kind of felt, as described with wool, the notched edges making this somewhat easy. The principal use of fur treated in this way is to make hats, and you can easily tell a fur hat by its very soft feel. In thsi way the fur of the rabbit, hare, beaver, and other animals are used. In the colder climates fur garments are very much worn, but as we get to warmer climates they are abandoned for some lighter style of garment. In England they are freely used in the winter, and in America there is a very large trade done in this way. 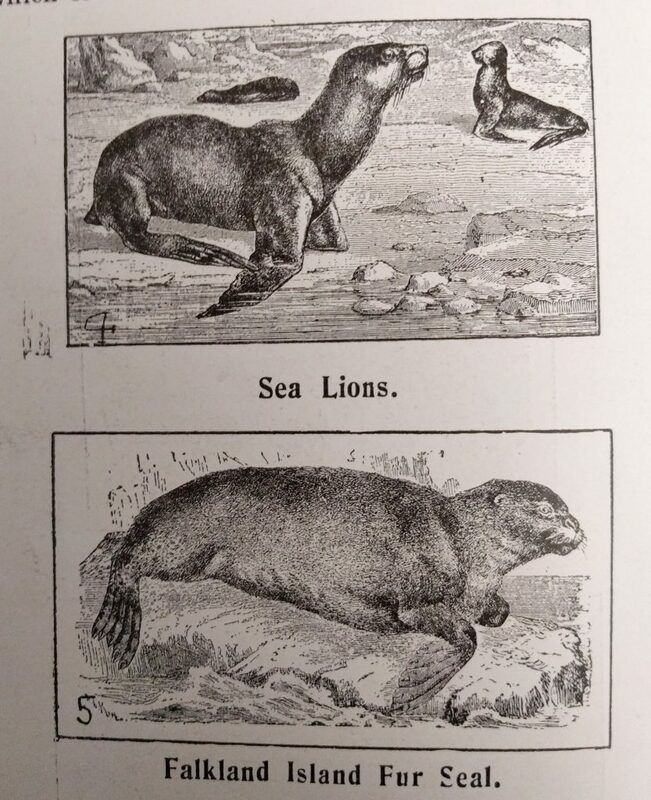 The illustrations are reproduced from “Furs, and Fur Garments,” by kind permission of The International Fur Stores, Regenet Street, W.
The skins of animals are also used for various articles of clothing when they are stripped of their fur. Thus we have leather breeches and gaiters made from sheepskin, buckskin, etc. Leather is also used for lining and pockets, in which case chamois leather is used. Then we must not overlook the important part leather plays in the manufacture of gloves, boots, cap-peaks, belts, straps, etc., so that you see we not only use the fur or hair that grows on the outside of the skin, but the skin itself is transformed into beautiful garments. We are not content, however, to take tribute of the animal world, but we must also invade the province of the birds, and take from them their feathers to trim our garments. The fishes also supply us with several useful commodities, such as whalebone, so extensively used in the making-up of ladies’ garments, and shark’s skin, used for leg coverings, which are useful when climbing tall, smooth trees. Even such uncanny reptiles as snakes and alligators are stripped of their skins to make up into fancy vests, slippers, purses, and various other articles. But they do not stop there, for the shell-fish have to yield to us their treasures,a nd the insects their blood and entrails, for do we not send divers to the bottom of the sea to seek for pearls from the oysters who live there? do we not use the cochineal (which, bye the bye, is a plant louse found on the Mexican cactus) to dye our garments a beautiful red, and, finally, we take the silk spun by the silk worm from its inside to make linings for our coats, and garments of many other descriptions? Now, I am sure you will find the story of an ostrich farm, such as may be found in South Africa, full of interest. You will read the adventures of the pearl diver as he goes down, down to the bottom of the sea and brings up oyster after oyster with enthusiasm, but as these do not often come into the tailor’s hands to manipulate it must suffice for us to just mention them and pass on, but the importance of silk as an articleof clothing is of such a character that we must stay to consider a little of its history. will be for you to keep some silkworms, a penny will supply you with some eggs, and then you can hatch and then watch the little worms grow, spin their silk, change into a moth, lay the eggs of future generations, and then die. I think I have already referred to the fact that the countries of the East, such as China and Japan, wear silk almost exclusively, but in England this material is a luxury only obtainable by the well-to-do, but as these usually come to the tailor for their clothing and as you will often be handling silk, either for sewing, lining, or decorative purposes, we will briefly describe the process through which it goes. To begin with, the egg of the silkworm is about the size of a small pin’s head, and the worm when hatched is like a little bit of thread, not quite half an inch long. It grows rapidly until it gets to from 2½in. to 3in. long and about the sixe of an ordinary lead pencil round, and during this time it changes its skin four times. This occupies about a month, and then it gets ready for the great task of silk spinning, when it makes for itself a little box or coffin of silk, the threads of which are double, one coming from each side of its body. This occupies four or five days,and then it prepares under this the cocoon proper of a yellow substance, and by the time this is finished the silkworm has become a chrysalis, and in this state it lies for about three week, when it makes its way into the outer world again as a moth. where it is wound on bobbins, and two, four, six, or eight threads are placed together and turned round very rapidly on a spindle. This twisting of the threads is known as spinning. A number of threads are again doubled together, twisted the reverse way, and this is called throwing. Machine silk is generally made of three threads, embroidery of two, and so on. The next step is to dye it, and this necessitates its being boiled for several hours in order to remove the gum, which forms nearly a quarter of the raw material. It is then dyed to the colour desired and here it may be of interest to remarks that most of the dyes now used are made from plants, insects, and shell-fish, and it is said these latter were far more lasting than those now used, but theye were more costly, and so had to make way for the cheaper methods. The silk is now skeined or reeled, according to its use, and then prepared for the market by labels, parcels, etc. If it is to be woven into pieces of material, then machinery is again bought into play, and it is woven into silks, satins, velvets, etc., etc., as may be desired. 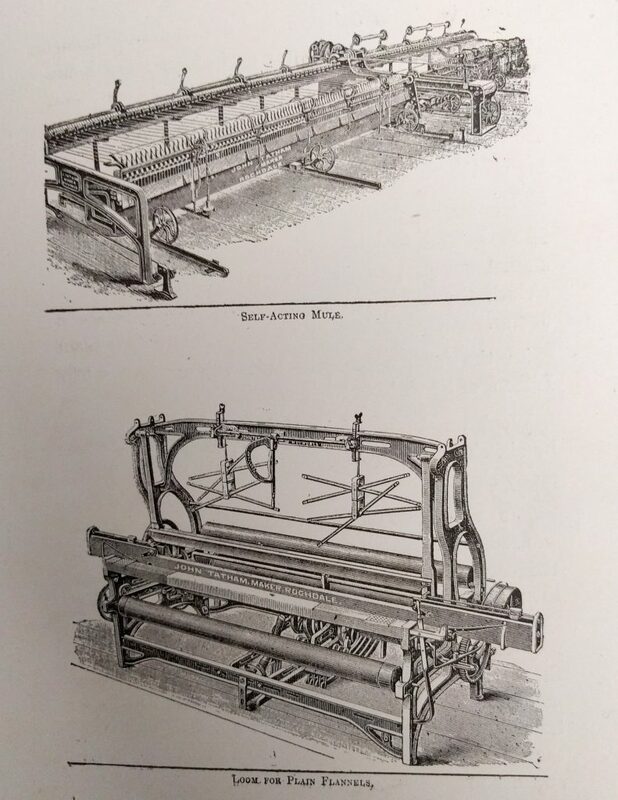 It sis not necessary for me to describe the nature of a silk loom, but if ever you visit the Crystal Palace be sure you visit the looms of Messrs. Stevens of Coventry, and see them weaving such lovely pictures in silk. It is said that to produce enough silk to make a lady a dress it needs the cocoons of about 8,000 silkworms. These are when first hatched would altogether only weigh about quarter of an ounce, but during the four or five weeks of their existence they would eat nearly 400lb. of mulberry leaves, and would increase to about nine thousand tines their own weight. The amount of raw silk they would produce would be about 2lb., but as this would have a great deal of gum it would only weigh about 1¼lb. when quite clean. This when made up would suffice for a lady’s costume. What wonder id it that it should prove an expensive material when so much time has to be given to the hatching, feeding, and tending to the worms, as well as winding, doubling, dyeing, and weaving the silk. I purpose varying the monotony of the descriptions of the various kinds of manufactured animal substances by treating you to an article dealing with the Clothes Moth. There are few tailors of mature years who have not had more or less experience of the depredations caused by the moth, and it is a difficult question to decide whether to look upon this little insect as the tailor’s friend or foe, for under different circumstances it may be both. There is no doubt that many valuable piece of cloth has been spoilt by the mandibles of these little insects, and the tailor’s bank balance has had to suffer accordingly. 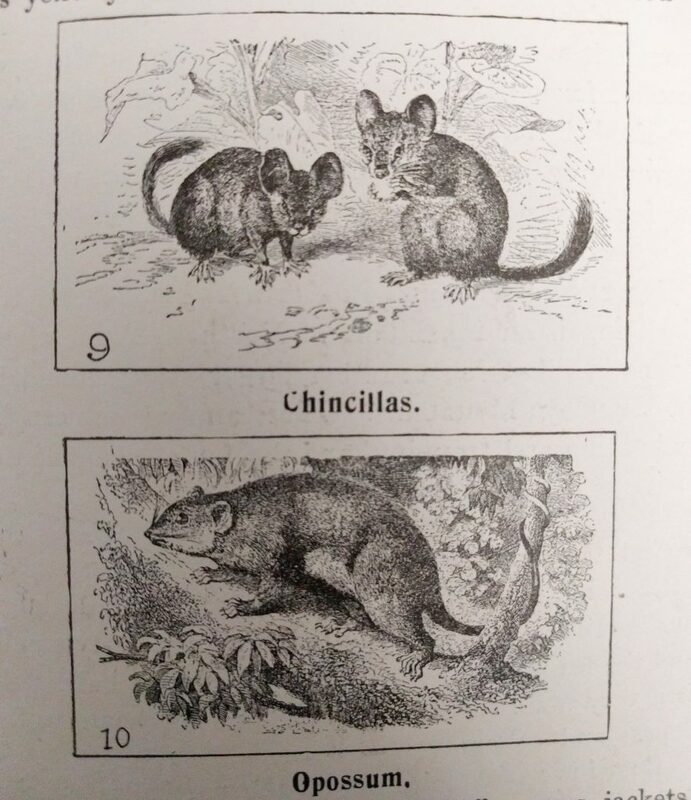 As if to compensate in some measure for this, the clothes moth has busied himself in the wardrobe of the tailor’s customers, and so maimed their garments that they have come to him sooner than they would otherwise have done. It is not the little moth which you see flying about that actually does the mischief, but she is the parent of eggs which, at due time, hatch into little maggots rather less than half an inch long. These are provided with two admirable sets of teeth, and these they work on the woollen and hairy fabrics in which they are deposited. What they eat in this way provides them with foods, and from it they also make a little cloak to cover their bodies, and this they line with silk. Named Reamur, who made a study of these little insects. to a moth. Then it seeks out some corner of a drawer or wall, and here it hangs up its cloak by the aid of silken threads, arranged both vertically and horizontally. Then it closes ends of its cloak with silk, and gradually it changes into a chrysalis. First it is yellow, then it is red, and then in two or three weeks it grows its wings and pierces an opening in its sheath, and finds its way out into the air, and starts on its voyage of discovery for fresh coats or cloth in which to lay the eggs of future generations of moths. The moth is very particular where she lays her eggs. She will pitch on a pile of wollens and go from piece to piece, and having examined them all, select the finest textured piece, and in this she finds a dark spot with just sufficient air, and there she reposits her eggs by the hundred. It is said that the moth is very fond of grease, and if there is only one spot of grease in the garment it will select that. and here we are glad to have Reamur’s observations again. He knew that it was the custom of some housewives to put away fir cones to keep away the moth, and, knowing that the smell of these was due to turpentine, he determined to experiment with that spirit. First he rubbed one side of a piece of cloth with turpentine, and put some grubs on the other side. The next morning they were all dead and, strange to say, had all left their cloaks. Then he smeared some paper lightly with turpentine and put it into a bottle with some grubs. The weaker died immediately; the stronger ones struggled for about three hours, left their little cloaks and died in convulsions. Hence he proved that a very little turpentine is fatal to these insects.It is also stated that the fumes of burning paper, wool, linen, or feathers are also effectual, the thick smoke killing them. The smell of tobacco smoke is a most effective protection. 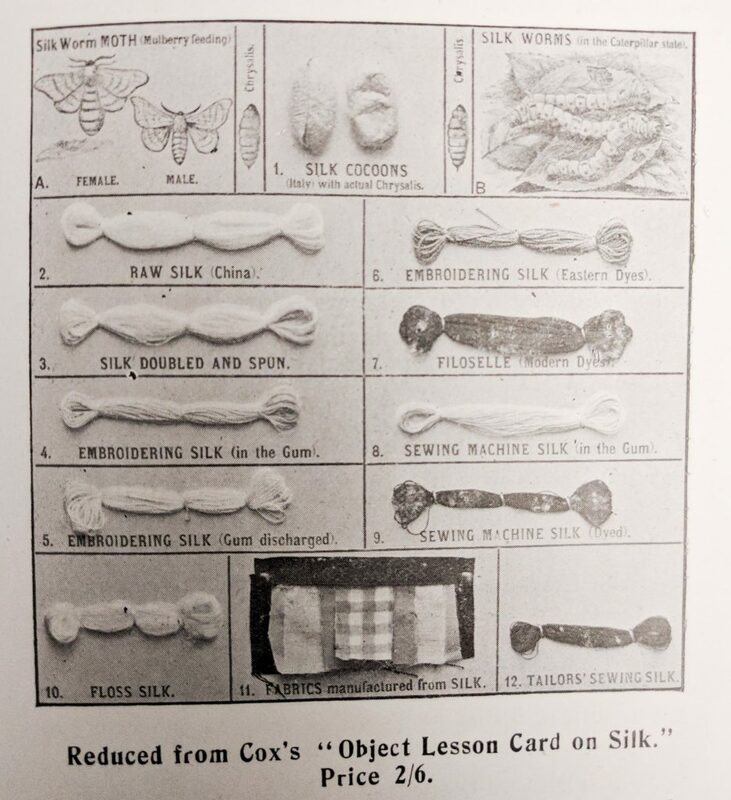 Camphor balls, cedar wood, naptha, salt, bitter apple, are all amongst the agents used to destroy these insects; but perhaps there are none so effective as a few rolls of cotton wool saturated with turpentine.